I have a doll that has H7X on the bottom of both shoes. The shoes are painted on. She is 13" tall. She is a china head doll with cloth body, and china arms and legs. I believe the yellow dress is original. 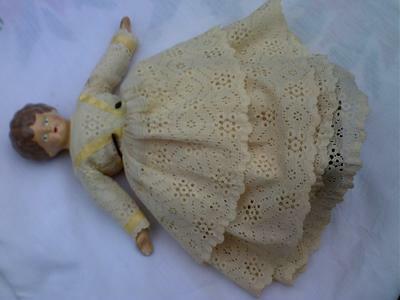 Hi, She looks to be a reproduction of an antique china head doll. I would date her to circa 1960s or so.